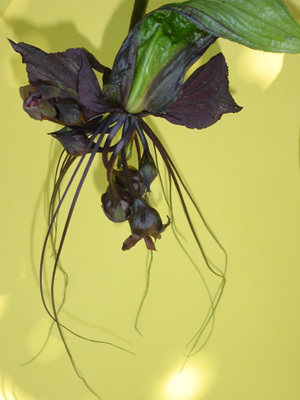 The Black Bat Plant is one of the most unusual blooming plants I've ever seen, with its black whiskered blooms that seem like something out of someone's vivid imagination on Halloween. The black color sometimes runs to brownish or purplish. It's a tuberous rooted perennial that grows to about 2 feet tall, with large dark green quilted leaves. This plant forms clumps that do well in filtered light and rich moist soil. Propagation is by plant division or seed. It also does well in containers. This plant is sometimes known as Devil Flower or Cat's Whiskers. Tacca integrifolia is a white version of the bat flower.